June | 2015 | Whose Education Is It Anyway? There have been a few surveys that I have been asked to complete of late which have highlighted some of the issues in multiple choice questions and how, when we use questions, we need to avoid our own bias from influencing proceedings. Now, most survey advice sites would recommend test groups to iron out bugs in the system. 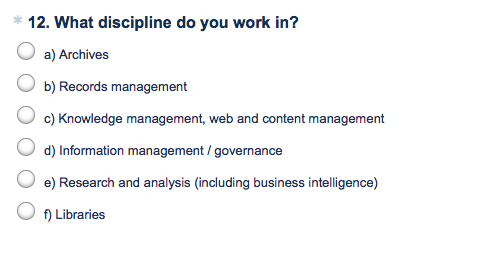 CILIP’s recent survey, part of the workforce mapping project, seems to fail pretty early on. As the included picture shows, the survey attempted to enforce something of a discipline taxonomy on those completing the survey. There was little space in this question for people making use of information skills but in a different discipline (like Learning and Development for example) even when the project website itself states “professionals are developing new roles in business, industry, government, and the third sector”. Indeed it ignores, for example, someone who has gone down a data scientist route and, I presume, the question will cause the usual consternation from the old Institute of Information Scientists members, although they perhaps would just opt for the option with a mention for “information”. Overall, it is presumably part of an attempt by CILIP to engage with groups they have lost touch with, so at the very least not conditioning the question to say, something like, “which discipline do you most affiliate yourself with?” seemed a misstep. As your skills will clearly fall into a traditional discipline, there is no other. Pretty sure the 70:20:10 Forum were the source of the below question. 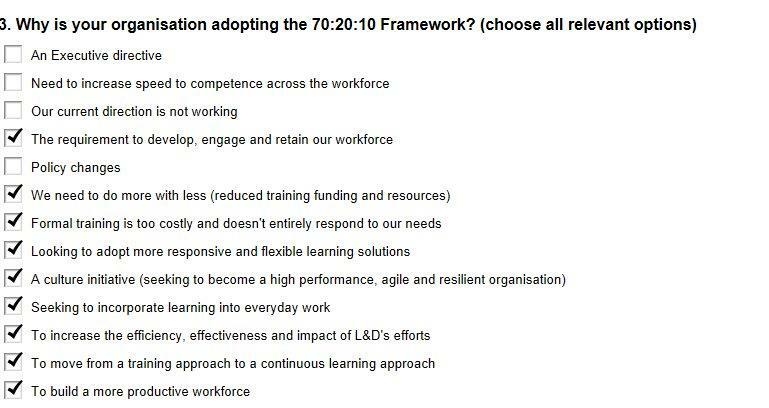 Now I appreciate that people may be ‘adopting’ the framework, in terms of the support and recommendations in the model. However, surely half the battle (or 80/90%) is just making L&D realize that very few (if any) professions have ever been able to teach everything people need to know through formal learning. Again, I guess my gripe is in the wording but it seems to be suggesting something to adopt rather than saying the 80/20 split is about right (let’s go as far as to say accurate/truthful) so why are you only now doing something about it? Do you want to know the truth? You can’t adopt the truth. Credit to Training Journal for doing some work on the feeling, that most people probably have in L&D circles, that the gender balance seems to get skewed towards the masculine end of the spectrum as you look at who occupies more senior roles. Whilst I completed the survey my major problem was that, according to it, all organizations are 10,000 people or smaller. This seems a really odd one to get wrong unless it is deliberately aiming at SME type organizations (if it is then fair enough but I must have missed the note to that effect). When I reflected on the winter Learning Technologies event I felt the main message was that Learning and Development professionals, collectively, seemed to be failing. In contrast, the summer event seemed to have a feel of ‘things are getting better’. Certainly, in the case of my own practice, I can say we have been able to have more of the right kinds of conversations internally – much more about appropriate performance support, via a blend of solutions and that these conversations are starting to happen with senior leadership very much engaged. In the context of the first paragraph, the final session I attended at the Summer Forum, on Learning Leadership, was perhaps of most interest. The focus was on practical things we can do to have great conversations, with a vision for the future beyond order taking. 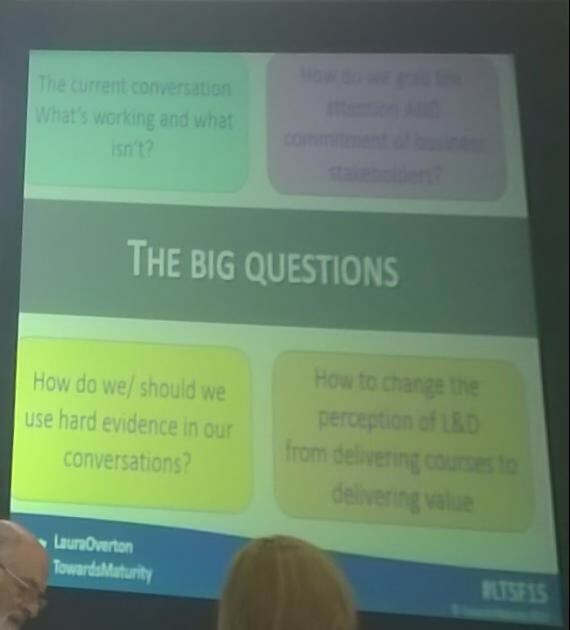 Based on the good work of Towards Maturity there was an opportunity to tackle ‘the big questions’ (see pic) via a group workshop to capture some of the crowd’s wisdom. Overall, the message slowly seems to be getting through that you need an evidence based approach, using data to back conversations with the business (which in turn need to be in business, not L&D, language). A point was made that, as we have not read L&D’s postmortem, the doomsayers were wrong, I’d say the key thing here is ‘not right yet’. Things might be getting better there’s undoubtedly a lot still to do for many organizations. Opening Keynote: The Power of Play – Deborah Frances-White. A very invigorating and funny opening keynote. The theme was familiar, as children we play (learning in the process) but we get scared to fail as we get older, but there some fun activities involved which I could try in groups as icebreakers in the future. As the presenter pointed out, play and work can be both be seen as processes – which is appropriate depends on what you are trying to achieve (I particularly liked the idea that you cant ‘work on a relationship’ to save a marriage: you have to re-inject play). The presentation ended with a mass game of rock, paper, scissors – with you told to cheer on who you lost to and then their conquerors, and so on. It was provided as something you could do in your office to inject play and change culture – I wonder how many people have been brave enough to try it since! Video for Learning – was made up of two parts, one a video with some tips on technique and equipment. The second an update on where BP have got to with their video usage. a very good video which managed to capture emotion, including by playing an interview over real footage – rather than just talking heads. The BP experience is interesting, to me, in how in the in-house video solution has been owned by learning, and allows for user generated content, whilst the team includes people with marketing and journalism backgrounds to ensure the right skills are in place. In other words, the learning team did not wait for someone else to get the platform in place for them (it would seem). Mobile Learning – some tips from Telefonica on their experiences. Unlike Qualcomm’s winter presentation that showed an app store with multiple in-house apps, Telefonica have gone down the single app route via CM Group. The app is heavily used but, similar to tools like CampusM in Higher Education, it offers other elements (like bus timetables) so is not ‘learning’ in a pure sense. However, the argument was this is more of what was needed for new graduate hires and had advantages, such as offline access. Conversations around the event space included a number of topics. There was some concern that eLearning vendors are not really ‘stepping up to the plate’ with some kind of truly engaging paradigm in our new mobile/HTML5 world. I also had some conversations around the continuing value of big library solutions (Skillsoft, Lynda, etc) and if L&D are best to retract to ‘in-house’ and allow people to source other generic things elsewhere, possibly via LinkedIn Lynda subscription (since the event I have had an email from LinkedIn offering a seven day trial for subscription to Lynda so that acquisition seems to be leading to some new models already). One advantage of being based in London is the multitude of events that you can go to of professional interest and for networking. The events come from a wide array of organizations and I once sat on the CILIP in London committee, helping to organize events for LIS professionals. Indeed one aspect of my role was in setting up a number of digital profiles and initiatives, including a calendar which sought to aggregate London events of interest from CILIP and other bodies (partly to stop us booking events on the same dates as other events!). I left the committee largely due to time commitments and since then I have not done very well at attending in-person evening events (although I continue to attend large numbers of webinars and have managed to make a number of events ‘in work time’). Anyway, I did manage to make an event this week (partly as Wednesday is by far the best day for me) and a few notes are below. The Tech Meet Up promised a number of quick 3 or 7 minute presentations on technologies that people are using which might be of interest to a wider audience. How varied CILIP’s membership is and the value in the sharing of ideas amongst it. Aurasma – for adding augmented reality around displays, guidance, via QR codes to explain how physical tech works, etc. I particularly like the idea of using augmented reality on a final product to trigger videos showing how it was produced, stills on the production process, etc. InMagic (new to me) – for easy creation of bespoke databases. The tool looked ugly but easy to use and, as the presentation stated, it is possible to use it for what would otherwise be expensive systems (for example on independence checking relating to clients). RSS – this went beyond the basics of RSS (as you might suspect considering the audience – although a number of people admitted abandoning RSS post Google Reader) to how the presenter is using RSS to monitor 2500 companies across 60 countries. As one might guess considering that scale, he is hacking together a number of tools including the BASE search engine, FireFox plugins (such as Bamboo), twitrss, feed43 and RSSMix. Learning Apps on VLE – how you can use LearningApps.org (new to me?) to easily create learning objects for embed into a VLE//LMS. B.scroative (new to me) – audience response with a very nice interface for quizzing with pros/cons vs other systems such as Kahoot. I let the organizers know that I was happy to do a number of presentations on different tech areas I have been working on. What I ended up doing is roughly captured in the embedded Slideshare presentation. I deliberately avoided creating any content myself – instead sourcing the presentations from online sources (please excuse ignoring of creative commons) to talk about the issues related to the space and the kind of technology solutions that can be brought into play. Learning communities via Enterprise Social Networks (ESN), specifically Tibbr. A consideration of how ESN functionality has evolved what we can do in relation to online community support. Capability/competency frameworks and the impact on learning support, including targeting resources, courses, coaching and other support at a more granular level. Interestingly, “Workplace learning and competency-based frameworks” was a title of an article in the latest CILIP Update. The article’s suggested approach seemed a sensible evolution, from my more manual mapping using tools such as those in SuccessFactors LMS’s CDP module, to a more data automated approach.